When James Carroll was brought into GoDaddy in 2013 as EVP of Global Platform Development he was tasked with a singular mission: transform GoDaddy into a global business. GoDaddy meant business when they said they wanted to go global—and so did James Carroll. With more than 20 years of experience in internationalization, James was already a major player in the industry, having led the localization of hundreds of notable products at Microsoft, Yahoo!, and Apple to markets around the world. In just 3 years, GoDaddy successfully reinvented itself as an international brand, with services expanded to over 30 languages and 56 dedicated markets, selling in 125 countries and 43 currencies. Their international paying users now account for over 7 million out of 18 million total users—40% of their entire business worldwide. Given GoDaddy’s now global scale, they now own 1 out of every 5 internet domains, making GoDaddy the largest domain name registrar. This means every day, they serve 18 billion DNS queries served daily across 71 million domains worldwide. 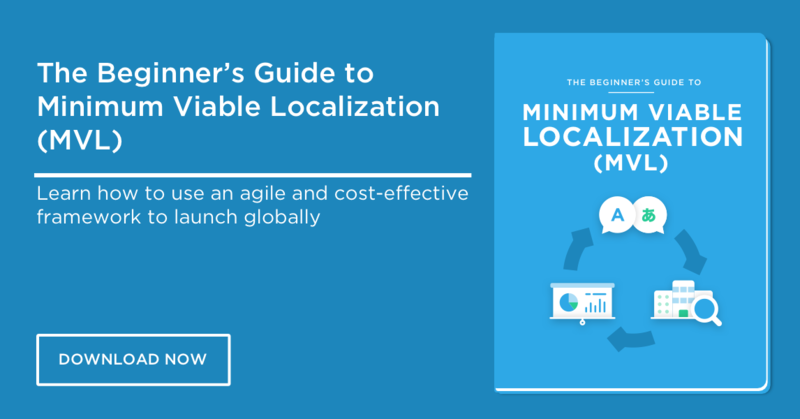 localizing on smaller budgets or for mobile apps and games. It all starts with a solid plan. Before those 56 markets and over 30 languages were a reality for GoDaddy, they were strategic goals in James’ global expansion plan. In a presentation James gave earlier this year (link at bottom), he began by emphasizing the importance of designing a carefully thought out localization plan. “When I came into GoDaddy, I gave myself six weeks to develop the plan on how we would bring the company global,” says James. Build for a global scale—from the start. Localization plans often call for planning to be everywhere in the long-term. Be everywhere in X years is a catchy goal to center your team around. But James recommends setting your sights on scaling globally much earlier, at the very beginning. “Be global before being local,” he says. This means building and using the correct platform and processes that can handle your scaling across markets, even if you’re only launching in one new market. Having a global mindset helps to prioritize robust systems that will “minimize the speed bumps” in your first new market, and stand the test of the next 50 markets. “Many companies get ahead of themselves and start to sell globally, even without the ability to correctly handle foreign customers.” As James points out, even something as simple as capturing customers’ phone numbers and showing pricing in different international formats can be a logistical nightmare if you don’t have the correct systems set up—especially if you’re not looking out for them. A tool that helps you effectively scale up localization efforts is a Translation Management System (TMS). Read about the 7 benefits of a TMS for your app or product here. Delivering customer value means different things across markets. With his expansive responsibilities as EVP of Global Platform Development—helping GoDaddy build out global products for its international audiences—prioritizing James’ daily tasks is a serious undertaking. One of the biggest problems he sees companies facing in trying to localize is failing to “deliver an immersive cultural experience” in each market. They need to go beyond good translations, although translations have to be world-class from the start. GoDaddy’s India marketing campaign is a perfect case study for the “experience” James is referring to. As one of the first countries that GoDaddy entered, India was strategically important: 26% of its 1.3 billion population is now online, with that percentage growing rapidly. GoDaddy’s mission was to raise awareness for its small business offerings and domain services. Given television’s status as a huge medium nationwide, James’ team rolled out a TV ad that was a hit with local audiences for its use of Hindi language and culturally-based humor. On the ground, GoDaddy hired local customer care agents. Experienced, aligned teams are at the center of localization success. “So it comes down to ensuring you have the right people onboard.” James spends a significant part of his time hiring and enabling his team, looking at culture, experience, and personality fit for GoDaddy’s global mission. To achieve this, the localization plan needs to be communicated well and progress must be visible, so that teams “have the right context” and know how to play their part in growing the brand internationally. James pulled this off at GoDaddy by developing a communication protocol and participating in each communication milestone as a way to go through the localization strategy in detail. As we’ve seen in the past, clear documentation at a centralized place that the whole team can access also does the trick. Cross-functional teams—especially those spread all around the globe like GoDaddy’s—rely on communication tools to help them stay on the same page. A TMS with built-in collaboration features like OneSky helps teams communicate and edit directly with their internal and external partners. Learn more about our free collaboration tools here. Small budgets and mobile apps can go far in localization. Similarly, for mobile apps, James suggests making them broadly available from the beginning, then doing market analysis on the countries where it will perform well. From this, James deduces there will be more e-commerce across borders, “not just from the big guys, but from smaller companies.” It will become easier for companies to talk to customers from different countries as tools and translation services continue to improve in speed and quality. Some regions will be of special interest, including Asia, which James notes has been a “fulcrum” of mobile development growth. Localization matters to the business. Beyond delivering better customer value, going global has allowed GoDaddy to rapidly and successfully scale up their operations and grow their user base. GoDaddy’s mission to help small businesses succeed is one that James Carroll fully believes in. This equation demands successful and thoughtful expansion into new markets. 1. It all starts with a solid plan. 2. Build for a global scale—from the start. 3. Delivering customer value means different things across markets. 4. Experienced, aligned teams are at the center of localization success. 5. Small budgets and mobile apps can go far in localization. 6. Localization matters to the business. As head of Global Platform Development, James drives the architecture and development for all of GoDaddy’s global business and product platforms, including the systems that power global marketing and ecommerce systems worldwide. Before joining GoDaddy in 2013, James was a Senior Vice President at Yahoo!, where he directed the company’s global R&D centers across Asia and the Middle East and oversaw international delivery of all Yahoo! products and services worldwide. Prior to Yahoo!, James spent 13 years as General Manager at Microsoft, where he managed the MSN international team and later, the Windows and Windows Live international teams. GoDaddy powers the world’s largest cloud platform dedicated to small, independent ventures. With more than 17 million customers in over 125 countries — including 40% of our customers outside the US — and with over 71 million domain names under management, GoDaddy is the place people come to name their idea, build a professional website, attract customers, and manage their work. Earlier this year, James shared his experiences of bringing GoDaddy global in a presentation titled “From Big To Massive” at the LocWorld Conference in Shenzhen, China. Many of this article’s insights were sourced from that talk. Here is a full transcript with James’ slides. This entry was posted in Case Studies, Global Management, Unicorns, Web Localization, Where to go. Bookmark the permalink. you can get all the apps in one app just go through the links given here..